The Cousins’ War is Surprised Stare Games’ 2-player game of the Wars of the Roses. It was designed by David J Mortimer, who showed it to me in 2016. I was immediately struck by the elegance and depth of the game – such a lot of game in what was almost a micro-game format: 18 cards, 3 dice, a small board and 27 cubes. I really liked the theme too, as I’ve studied a lot of military history, and I’m a wargamer. So, I persuaded Tony (relatively easily I would say) that we at Surprised Stare Games should publish it. The original edition was launched at UK Games Expo in June 2017. It came in a small box with beautiful artwork by Klemens Franz and was printed by NSF in the Netherlands. We weren’t sure how well it would sell, as it was a bit different from, not only other SSG products, but also from conventional micro-games or wargames. The Cousins’ War combines both the depth of multi-use action card play with secondary actions usable by your opponent, as in Twilight Struggle, and also a bluffing dice game – like Liar’s Dice – for the battle at the end of each round. The whole fits together very neatly, providing interesting and challenging decisions and a little dose of luck, with the additional advantage that it takes only about 30 minutes or so to play. The cards are highly thematic and the battles too feel very appropriate to the period with bluff and counter-bluff playing the parts of feint and treachery. The Cousins’ War proved to be very popular. 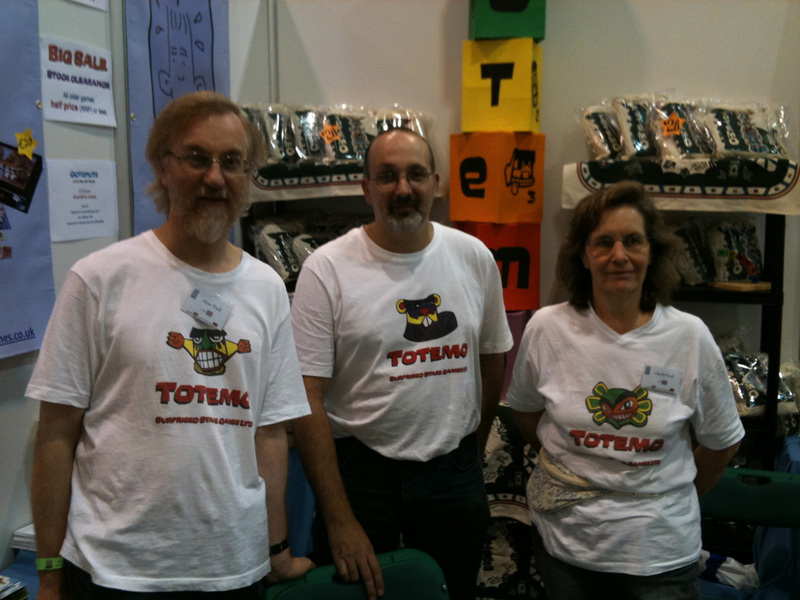 Not only did we sell large numbers at UK Games Expo, but lots of shops in the UK sold large numbers too. We had multiple re-orders very rapidly from multiple shops. By October we’d almost sold out, and we sold the last copies at Essen Spiel ’17. Rather than immediately re-printing the original game, we decided to produce a new second edition with our international partners: Flying Lemur Game Studio in the USA, Frosted Games in Germany and 2Tomatoes in Spain. Producing more copies reduced the unit costs and made the game more viable commercially. These savings also enabled us to meet the new market demands: the small size of the original game was not good for the additional markets – a larger-sized box is easier to sell, and it enables us to show off the artwork to much better effect. So, over the next few months, The Cousin’s War second edition was born. We retained all the strengths of the first edition: the artwork is basically the same, the rules in essence unchanged, so it is largely the same game. It’s also larger. We turned the box art round, so that it is portrait orientation for a cleaner style. The larger box meant we could produce a larger board – much easier to handle the cubes on it; and on the reverse we have space for the full panorama of Klemens’ original artwork. The cards are about 50% larger, so that the text is easier to read, and the play aid card was completely re-designed to make it clearer. While the rules remain the same in principle, we took the opportunity to ask Gaming Rules! expert Paul Grogan to go through them with a fine-toothed comb. Klemens re-worked the layout on the larger pages, so now we have an excellent set of rules with many more examples of how to play. Finally, we could afford to produce better quality dice, so the new game sports 3 white-with-red-spots for the Yorkists and 3 red-with-white-spots for the Lancastrians. Shortly after the launch of the first edition, we produced the Events expansion – a small number of additional thematic cards to change the game in a minor way each round. For the new edition, we have integrated this expansion into the main game as the Times of Change expansion. The Times of Change adds an extra level of replayability. The Cousins’ War 2nd edition was launched at Essen Spiel ’18 and has been very well received. We aim to follow up The Cousins’ War’s success with more small games in the future; we have several more little gems in the pipeline. The title of this blog post is also the title of a two-day workshop at the School of Transformative Leadership, the Palacky University, Olomouc, that I delivered recently, ably aided and abetted by Gary Hampson and Charlie Paull. 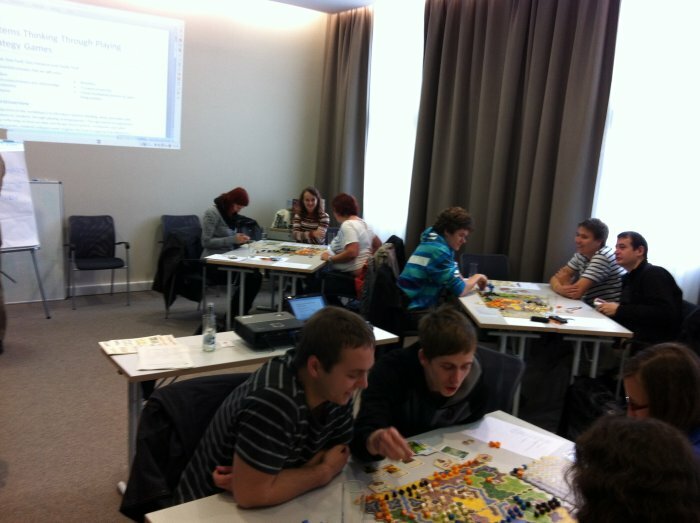 A major reason for doing this workshop was that Charlie and I could continue on from the Essen games fair to Olomouc in the Czech Republic. ‘Essen’ (as it is known to the gaming cognoscenti) is the largest game playing and selling festival in the world – the ‘Spiel’ (Internationale Spieltage) is an annual 4-day gamefest involving around 150,000 people, and Charlie and I trek out there every year under our Surprised Stare Games hats. 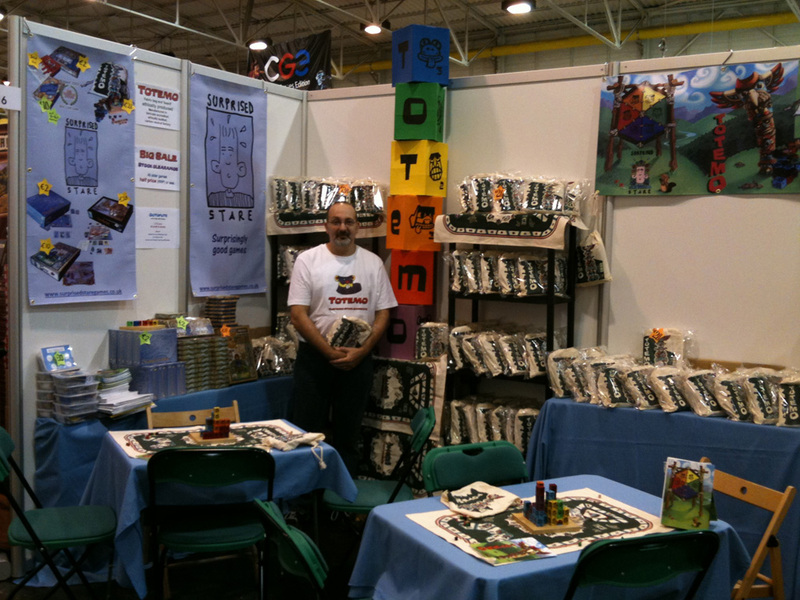 This year, Spiel ’12, was a great show for us, as we sold out of our new board game Snowdonia. A second major reason was that it combined two great interests of mine – systems thinking and playing games. The systems thinking derives from a healthy dose of Open University courses that Charlie and I pursued over 20 years ago. We’ve been using these techniques in our working lives since then, and they’ve strongly influenced my game design habits too. And a third major reason was that I was invited to do it by Gary, a gaming friend who had fairly recently obtained a research post at the University in Olomouc, so it was an opportunity to catch up. Coincidentally we were also able to celebrate Gary’s birthday the day after the workshop before we had to endure the 1,000 mile drive back to the motherland. Fortunately it was OK to deliver the workshop in English, as I know no Czech. We had 23 participants from a wide variety of courses, ranging from Philosophy, Education and Film to Chemistry. The workshop was an ‘elective’ one, so to a great extent the students attended by choice, having a number of such ‘extra curricula’ workshops to select from. The workshop was run under the auspices of the School of Transformative Leadership is part of an EU funded project, the University 4 The Future, an innovative new model of how to set up and run a university. We alternated between playing the games and covering the theory illustrated by the games. We started by having plenary sessions for the theory, but found that getting responses from the whole group was difficult, as individuals were reluctant to speak. Therefore we switched to individual and group tasks, followed by discussions in which we could ask individuals to respond for the group. This worked very well. Kingdom Builder – this is very easy to teach in large groups, has got predictable play length if you pick the cards and boards, and it’s readily available. It has easily discernible sub-systems and elements of both strategic and tactical play. Additionally I was able to get 6 copies from Queen Games at Essen Spiel ’12 for a small discount, owing to our educational use (thanks to Queen Games for that). Fzzzt! – also quite easy to teach and predictable play length with strategic and tactical play. We were able to use SSG copies for this, brought over as surplus from Essen. Seven Wonders – more difficult to teach, as it has a significant learning curve for non-gamers, and requires single game teaching really. However, it can take up to 7 players and is highly engaging with strategic and tactical features; it’s not too difficult to play once you’ve grasped the basics. It looks very complex, though this can be deceptive, so good for teaching ideas of complexity without being too daunting. Ticket To Ride: We had thought that Ticket To Ride would be another candidate, but in the end we were less confident of the play length, particularly as we had numerous expansions, rather than base copies, which meant that teaching across groups would have been more difficult. In the end we used it as a ‘final play’ game, rather than a particular teaching aid. Snowdonia – used as one of our complex games, primarily because we’d been teaching it a lot at Essen, as it was our 2012 SSG release. Hamburgum – the other complex game, a favourite of Gary’s, this one went down very well. The structure of each day was 4 sessions: 09:00 start, break at around 11:00, 11:20 to 12:30/13:00; then lunch, then two afternoon sessions with a break at around 15:00. We were flexible about timing of breaks, so that we could get to coherent start and end points. This was really helped by having in-room refreshments – coffee, tea, juice, biscuits – and excellent support from the venue; we were in the Ibis Olomouc. At the start of day one, we introduced ourselves, the concept of a strategy game, and what we meant by systems thinking. Then we went straight into Kingdom Builder. Our teaching method for the games was for me to address the whole class, with Gary and Charlie answering questions, checking groups and firefighting. The exposition had to be very slow and careful to ensure each group was up to speed at each stage of the explanation. As English was their second (and in one case third!) language, for both game concepts and systems concepts, we had to keep the terminology simple, and also repeat concepts with different words, and get some response from our audience to know we were succeeding. This was difficult in the first morning until we got used to it. We needed to sound them out and work out what level of language complexity was possible. After playing Kingdom Builder we launched into some basic systems concepts: systems components (systems maps); boundaries; holism; relationships; emergent properties; closed mechanical systems versus open living systems; the games as a sub-system and containing sub-systems. We drew up a collective systems map of playing Kingdom Builder as an illustration of all the concepts. Trying to get them to think outside the game box (to think of systems outside the game) was difficult, until Charlie prompted with some examples. We covered a lot of ground, including an extensive explanation of emergent properties, including examples with regards strategies as emergent properties of games. We were then able to build on this idea; to develop or change strategies during game play, is an example of both game playing and wider application. We also started on control models, in particular the feedback control model. Our afternoon session was Fzzzt!, a very successful card game that we had published three years before. Using this as an example, we were able to illustrate the ‘rich get richer’ phenomenon (positive feedback loops) and contrast with negative feedback loops. We decided it was easier to engage them with individual A4 systems maps of the Fzzzt! session, than to have a plenary discussion. This was a good ‘hands on’ starter. One of our main techniques, and it worked very well, was to draw up diagrams using the games as examples, and post these around the room. By the end of the workshop most of the available wall space was papered with diagrams, about half of them produced by the students. For day 2 we revised our plan taking into account our day 1 experiences. First we littered the walls with all our diagrams from day 1, including the systems map for Kingdom Builder, a generic systems map, systems definition, control models, communications model, emergent properties, positive feedback and Story So Far. Our intention for day 2 was to focus on activities to engage them, followed by discussion and feedback, as a handle for the explanation of the points we wanted them to grasp. The central things we wanted to cover in day 2 were: complexity (difficult versus messy problems) and how to use systems thinking to address it. Techniques: rich pictures, generic systems model mapping, plus the basics of soft systems methodology to pull it all together. Finally we would get them to play their choice of game at the end. We could have translated this as: “we’re going to throw you in at the deep end, and then give you some techniques to cope with this”! After a recap of what we’d completed on day 1, we asked our students to form a line by their perceived level of confidence in playing the games. This took only a few minutes, and it worked very well – it had a major positive impact on the rest of the day. We were then able to pick off the most confident 5 students to be taught to play Hamburgum (the most demanding game) with Gary, the least confident 7 to be taught Seven Wonders (the easiest game) by Alan, and the remainder to be taught Snowdonia by Charlie. This session was interesting, because we had variable abilities and variable game lengths. Hamburgum looked to be the longest game, but we found that it was within 10 to 15 minutes of Snowdonia length. We fitted two Seven Wonders games into the slot. The purpose of this session was to introduce more complex and challenging games. Quite properly some players found this difficult, which is the experience we were looking for. More confident players helped them through, and this enabled more group bonding, which was good for the next session. We now introduced ‘messy’ problems and contrasted them with ‘difficulties’, using game examples and those from real life, including environmental and wider planning problems, and personal situations regarding further study and employment. This was important, because we wanted to relate the systems thinking increasingly to their own circumstances. 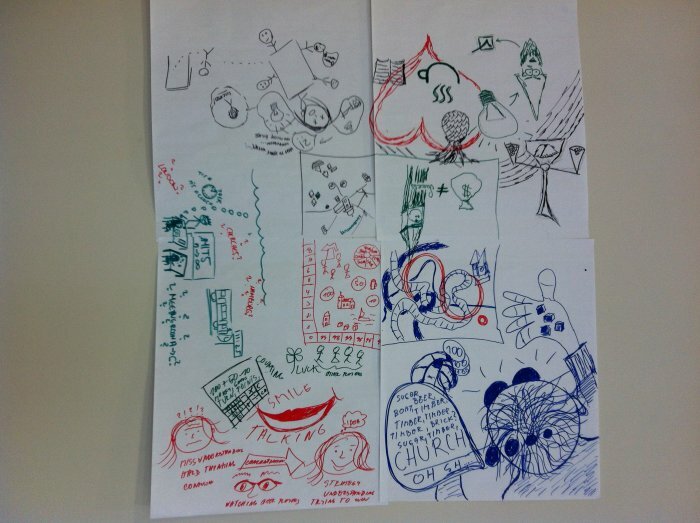 We retained them in their gaming groups (combining the Snowdonia players into one group) and set them the task of drawing a rich picture of their experiences in the previous session and the wider workshop. Charlie had drawn up an example of a rich picture the previous evening, so we were able to demonstrate the technique to an extent. The example was of day one and stressing the non-material elements. This part of the day needed a lot of individual hand-holding, prompting and thinking time. It proved to be very important to give each group the space and time to get to grips with the task. We covered the games tables with 4 or 6 large Post-It flip chart pages and gave them coloured markers and pens to use. We gave them about 40 minutes to do this exercise – and there was much scratching of heads. With individual guidance we triggered the initial ‘marks on the paper’, and by the last 15 minutes almost all were actively participating and some very creative and insightful pieces of work were added. Ideally, we would have had more coloured pencils or even crayons for this. Never give them yellow felt-tips – the marks don’t show up! Once we felt they had achieved enough, we rotated the groups and asked them to review each others rich pictures for 5 minutes (done twice, so each group looked at all of them). Then we called for questions and some discussion ensued. The best method we found for stimulating discussion was to ask for an individual representing a group to explain how the rich picture emerged – individuals were less inhibited in responding when talking on behalf of their group, rather than for themselves. We rounded off the session by explaining how to draw out themes from the rich pictures that would help to address problem areas systemically. We put all the rich pictures on the wall. On each one there were elements representing initial confusion followed by (eventual) ‘happy faces’ and understanding. This was very significant illustration of their journey (shown on the Snowdonia one as a train journey). In this session I explained the generic systems model and how to map other proto-systems to it. The explanation was taken slowly stage by stage, with reference to real world and game system examples at each stage. The final exercise was for each individual to do an A4 sized map of the system “A system for understanding systems thinking through playing and discussing strategy games” using the generic systems model as a template. We nursed some of them through this, while others found it plain sailing. This exercise needed more careful explanation as some students did not understand that they were to use the generic model and started their own fresh diagram or used a different system more directly to do with the game. However, the central purpose was to get them to think systemically, which was achieved. 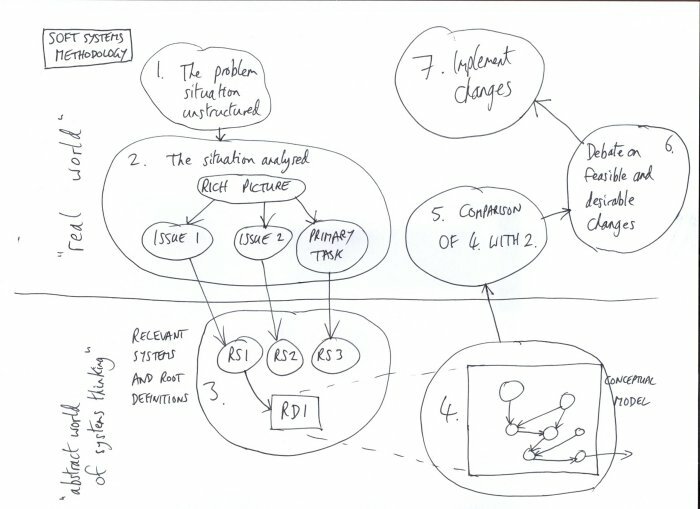 In the final session we gave a brief overview of the soft systems methodology (a lot of which they had now been through), using a hand-drawn diagram on an overhead. A number of the students found this very useful, as it gave a real world way of using systems thinking for specific purposes. Reflecting on this, it might have been better to present this overview earlier, because we do want to show the efficacy, purpose or point of the approach earlier in the day. Tony Boydell, Charlie Paull and myself at Surprised Stare Games undertake a regular expedition to Essen in October each year that happens to coincide with Spiel. Since we always take along a van full of games on the expedition, it would be a shame not to exploit the opportunity to nip along to the Messe and present them for the delectation of the many gamers who congregate there. And with an empty van to bring back, why not add in a few new games for the return journey? In short, it’s time for Spiel ’10. This year Tony’s taking the van, while Charlie and I are driving across rather than flying. We can then meet up on the ferry both ways. Owing to stress levels, this is almost always a productive time for game design. Lots of notes and drawings are made, though sometimes the process can degenerate into games involving small brown cubes. Stroud to Dover was our first leg – uneventful. Not even a traffic jam of note on the M25, though Ditzy (our satnav) took us south from Reading to link up with the M3 – didn’t feel like a great route. We had to negotiate to get a little emergency help on the stand, because our German speaking helper was unfortunately ill in hospital – she wasn’t able to make it to Essen this year, but is happily back in action. Thanks very much to Chooi [Teik Chooi Oh] and Daniel [Daniel Danzer] for putting themselves forward and also to Philip [Philip Bolton], a friend of Chooi who was unstinting in providing his time and proved a worthy Totemo demonstrator. Early start tomorrow (Tuesday) – up at 06:00 so we can get the early ferry and drive rapidly across to Essen, in order to put Totemo into the Press Room before it closes. I’d prefer to rush through this part of the report, in the same way that we rushed through France, Belgium, the Netherlands and into Germany. Once you’ve done this drive a few times, it gets a bit stale and monotonous. Ditzy decided to give us a little bit of excitement. In preparation for the trip, I’d updated her maps, but she seemed to have difficulty interpreting the new ones. She kept insisting that we were on a parallel ‘virtual’ road at some distance from the real one. In the end we switched the SatNav off, when we realised that she’d placed the Messe to the south west of Essen in open fields with no roads and only a couple of railway lines for company. As it happens, we knew the way, so we could mostly avoid detours. We also avoided the French fuel strike by remembering to fill up in Dover. My only worry was that there might have been a Dunkirk blockade – it’s happened before, but not around Essen time thank goodness. I guess there’s a game in there somewhere, but this time we managed our action points perfectly. 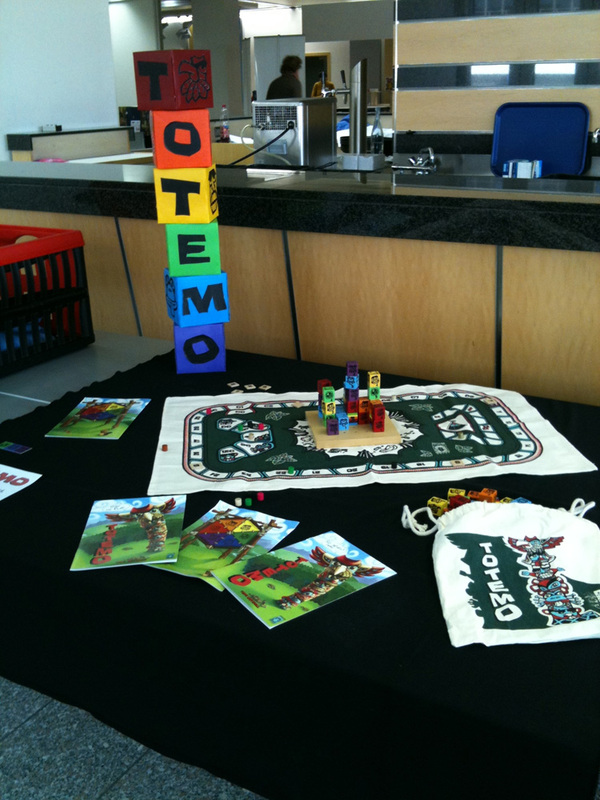 Charlie and I arrived at the Messe in time to construct a nice little display of Totemo in the Press Room, complete with the large table-top blocks that Charlie had spent many an hour making and painting in the previous week. All setup was done on time, so we were all ready by soon after lunchtime for the Thursday morning stampede! After our exorbitant expenditure on stand paraphenalia at our first Essen trip back in 2001, we no longer have special carpets and huge amounts of professional and expensive marketing materials and special furniture. We make do with 2 or 3 well designed banners, plus posters for the walls, lots of product, some shelving for the games, and most importantly chairs and tables for playing the games on. And for this year T O T E M O spelt out in large friendly blocks simulating the real wooden blocks of the game, made through the multiple talents of Mr Boydell. Most of our sales come from pre-orders, and converting players into purchasers. 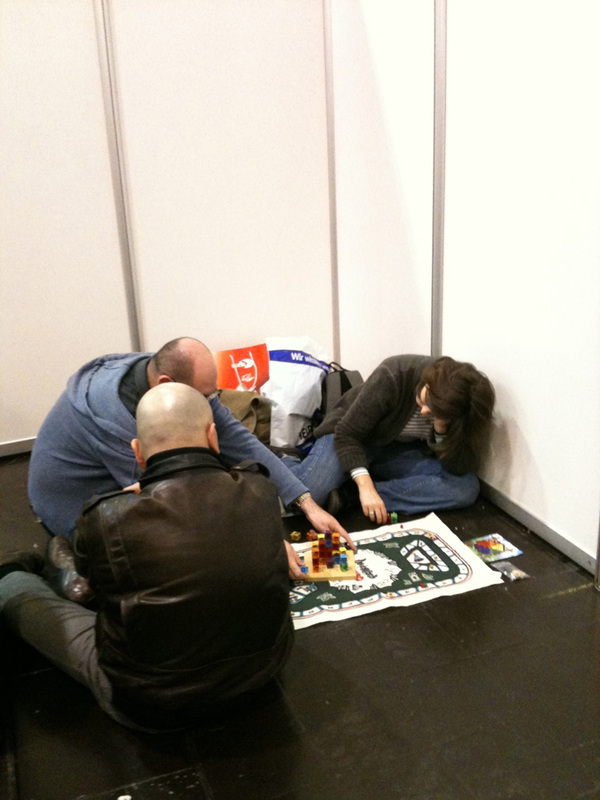 Essen is above all a convention for playing new games. Thanks to Chooi and Philip for their help setting up. And also to all the old friends who dropped by to see us. 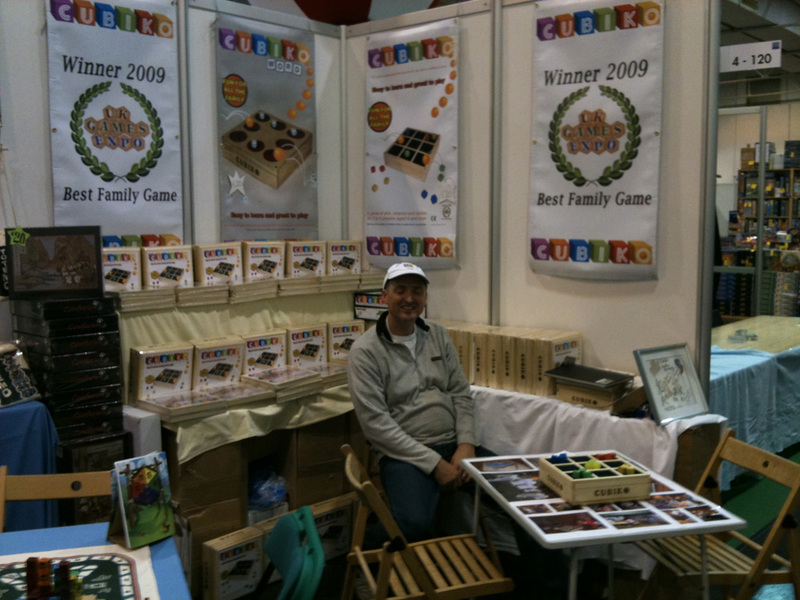 This year we are sharing our stand with Gavin, designer and producer of Cubiko. We’re also selling Octoputs, a game-for-charity produced by Mike Oakes. Wednesday gives exhibitors an early opportunity to hunt out essential purchases while the mass audience has not yet arrived. It’s also press day, so it’s important with a new game to have the stand manned in case of media interest. At this time, we hope to encourage press who’ve seen the game in the Press Room to come to the stand for a closer look and a demo. First purchases were High Frontier, Dominant Species (both on recommendation), Pocket Battles Orcs & Elves, Agricola G deck, Parade (a critical miss for us last year) and Bunny Bunny Moose Moose (and thanks, if that’s quite the right sentiment, to Kara from Leisure Games for introducing that one to us). In the evening we play tested some stuff. Pete Armstrong had his game ‘Wild’, which looks like it has considerable potential. Its theme is African animals escaping from wildfire. Elephants, giraffes, rhinos & lions all are fighting to get away. Each player has one animal model of each type, and a hand of cards, either randomly drawn or from a pool of 3 face up cards, to try to match with their 4 animals. The cards are used to fight off opponents, though herding animals can coexist in the same space. Particular points in the design that I liked were: time pressure and graphics of the approaching wildfire; movement restrictions by keying each hex by animal; card pool for drawing from, which could probably be extended, and the basic combat mechanism – which was quick, simple and effective. We made several suggestions for possible improvemenst, and I’m looking forward to the next safari. Then we had a quick 5-player go at Maureen Hiron’s new game ‘Up for Grabs’. I found it to be surprisingly fun! Not a game I would buy myself, but should have immense appeal to a mass market US audience. Unfortunately my post for Essen Thursday was lost when I published from the iPhone with no Internet connection . So this part of the report is a bit briefer than I’d like. After that I switched to composing the material in Notes then posting – see, I can learn! We spent all day demonstrating Totemo (there’s a surprise). Players liked it a lot, particularly the graphics, and we were busy the whole time, which is always a good sign. Many happy gamers went away with a copy, though there’s always the disappointment when a group that obviously liked the game leave with a thank you but no copy. 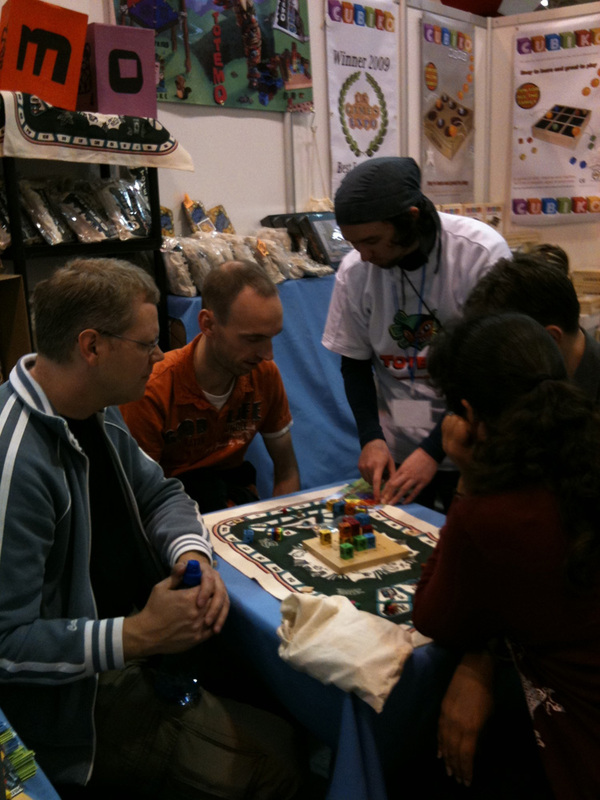 The nature of Essen is that people come to play and try out new games, but because of the hundreds of good and great new games that come out every year, no-one can buy everything that they want to. Sales were moderate, bearing in mind that Totemo is not a traditional gamers’ game, and Thurday tends to be a gamers and collectors day. Totemo will perhaps have limited appeal to Eurogame collectors. We had lots of families on the stand which encouraged us for Saturday, the prime family day. We like to have a few language experts on our stand, though this year our German was not our strong point. Our best moment was Philip explaining Totemo in Japanese to Banesto Games! Not many stands can do that. Also Chooi had a chat with a Malaysian importer too, so we had a very multicultural day. We also sold a small number of Confucius and Fzzzt! 2nd edition plus 5-6 player expansion – the new tin box edition that we have licenced to Gryphon Games. We had productive meetings with Schmidt Spiele, FRED and Cryptozoic about future products too. In conclusion for day one, we were reassuringly busy. Vicki’s artwork is going down a storm! Specific companies that have been impressed included Adlung Spiele, Gryphon Games and Kosmos, amongst others. Vicki is our illustrator for Totemo, having already impressed us with the box cover for Fzzzt! last year. 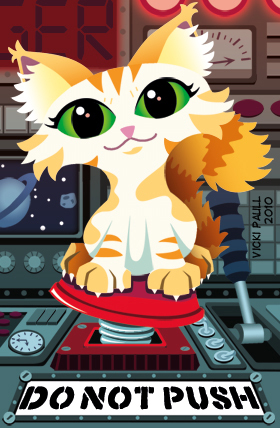 She has also produced the artwork for Braggart card game produced by Spiral Galaxy Games, unfortunately not out for Essen, but expected before Christmas. She’s also our daughter, and I confess that her artistic flair is inherited from Charlie and definitely not me. Today we had the opportunity to take some more display or play space, because the stand opposite was empty. It’s a curious situation that a company can book a 20m frontage stand, then not turn up. Though I thought this would be to the advantage of the organisers and ourselves, it proved to be too expensive, because Merz Verlag wanted to charge €400, and we would have had to rent or purchase furniture on top, making an extra cost of about €1,000. I had a wonderful response from neighbouring companies reflecting cultural differences. Myself, being English, was playing by the rules; the Poles had to refer up to a higher authority for a decision, and the Italians were all for just occupying the space without asking! In the end, none of the companies potentially involved expected to be able to cover the extra expense, so the mini-project didn’t materialise. We met up with even more old friends, including Jonathan and Lucy from Blighty. Both we and they run well-attended games weekends though at opposite sides of the country. We didn’t manage a game with them, because our evening plans did not quite mesh. Sometimes at Essen, we only get to say ‘hi’, because we’re so busy. We bought Troyes, a new Belgian Eurogame, and played it in the evening, 4-player with Sebastian [Sebastian Bleasdale, a well known UK games designer] and Caroline, his partner. For the first try it took perhaps 2.5 hours – the rules look pretty comprehensive; no problems with them. It’s a medium to heavy traditional Eurogame, and will probably take the 90-120 mins on the box. There’s a lot going on in the game. Worker placement gives access to mechanisms to convert resources to other types, and to generate VPs. However, the resources are primarily in the form of coloured dice – yellow for civil, white for religious, red for military. While high dice rolls help, they are not essential – in this game you can pay to use the other players’ dice, the price depending on the number of dice – from 1 to 3 – that you want to use for your action. Conversion of dice from one colour to another, adding to the dice total or other dice manipulation happens as part of your action, not as a separate one. Another great twist is that bonus VPs can be achieved through meeting the conditions set by your mentor (a character card randomly dealt at the start and hidden from tht other players). But everyone can get the bonuses from all the characters, so there’s an element of bluff. Recommended. Frenetic Saturday arrived at Spiel ’10. For the first time Surprised Stare Games has a product, in Totemo, that could be thought of as a Saturday game; one that will appeal to families and the general public. So it has transpired. As usual the halls were packed wall to wall – though some exhibitors have said it wasn’t as crowded as in previous years. For us, it was unusually busy. Previously we have had massive crowds ignoring us on Saturday. This time we were demoing all day. Sales were also good for a Saturday. It helped that we were high up the GeekBuzz rankings for most of the day. We were also pleased that for quite a lot of the time we had two games in the top 30 – Fzzzt! 2nd edition and Totemo. I had earlier picked up a copy of Pocket Battles: Orcs v Elves – a follow up to Celts v Romans and one that I had helped to play test. It’s a Z-man game designed by Paolo Mori and Francesco Sirocchi. I was also lucky enough to catch up with Paolo, as he stopped by the stand. Vasco de Gama expansion is due out soon, I hear. In the evening we met up with another Alan, Sebastian and Caroline, and Jonathan and Lucy. Caroline introduced me to Mijnlieff and promptly thrashed me (at the game). Then we gave Ascension a go. It was enjoyable, but why buy, play or design this rather than Dominion? Finally we had a 6-player game of Parade. Few turns and I think driven more by the draw of cards than skill (and I won). Probably better with three or four. The final day of Spiel ’10 dawned at, well, dawn. A quiet morning (tumbleweed slowly passing by) was followed by a much busier lunchtime and afternoon. We made a few sales to shops, including the final one in the carpark after we had packed up! Thank you to Swan Panasia! A few last minute swaps for Totemo with other designers included Sun, Sea and Sand (Cwali), Thunderstone, Antics (thanks Gordon). Weren’t able to swap for Mines of Zavandor as there wasn’t an English one available. We got our copy of the English 7 Wonders and special T shirt, so it paid to be at the top of the waiting list. Also picked up Sceptre of Zavandor for 10€. Packing up was swift if fraught, as we couldn’t bring the van to the stand – something about health and safety or German bureaucracy, take your pick. It meant we had to lug the lot out to the van in the parking area, under a time limit, because you’re only allowed a short window of time (30 minutes I think) with the van on site; if you take too long, you lose €50 deposit. Thanks to all the crew (including Julian, Pete and Gavin + Gavin’s dad). It was only on the Tuesday after we’d arrived back in England that we realised that we’d not packed up the game in the Press Room, so we lost the game, the cloth it was on, and Charlie’s hard-won special cubes :-(. Finally we had our usual wind down Mexican meal, a very relaxing and necessary ritual. 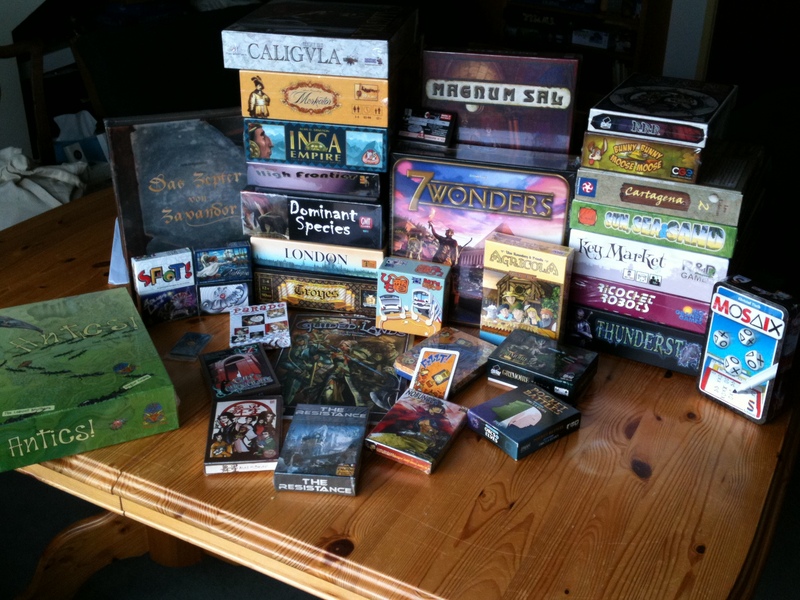 What we’ve bought at Essen Spiel ’10 – too much as usual. We made a few sales to shops, including the final one in the carpark after we had packed up! Thank you to Swan Asia! We got our copy of the English 7 Wonders and T shirt, so it paid to be at the top of the waiting list. Also picked up Sceptre of Zavandor for 10€. Packing up was swift if fraught, as we couldn’t bring the van to the stand. Thanks to all the crew (including Julian, Pete and Gavin + Gavin’s dad). Then we had our usual wind down Mexican meal. Hopefully there will be a more considered blog post later, but now we have to head ferrywards. Frenetic Saturday arrived at Spiel ’10. For the first time Surprised Stare Games has a product in Totemo that could be thought of as a Saturday game; one that will appeal to families and the general public. So it has transpired. As usual the halls were packed wall to wall – though various exhibitors have said it wasn’t as crowded as usual. For us, it was unusually busy. Previously we have had crowds ignoring us on Saturday. This time we were demoing all day. Sales were good for a Saturday. It helped that we were high up the GeekBuzz rankings for most of the day. I’ve picked up a copy of Pocket Battles: Orcs v Elves – a follow up to Celts & Romans and one that I helped to play test. It’s a Z-man game by Paolo Mori and Francesco Sirocchi. I was also lucky enough to catch up with Paolo, as he stopped by the stand. Vasco de Gama expansion is due out soon. Vicki’s artwork is going down a storm! Specific companies that have been impressed include Adlung Spiele, Gryphon Games and Kosmos, amongst others. We had the opportunity to take some more space, because the stand opposite was empty. This proved to be too expensive, because Merz Verlag wanted to charge €400 and we would have to get furniture on top. I had a wonderful response from neighbouring companies reflecting cultural differences. Myself, being English, was playing by the rules; the Poles had to refer up to a higher authority, and the Italians were all for just occupying the space without asking! We met up with even more old friends, including Jonathan and Lucy; we didn’t manage a game with them, because our evening plans did not quite mesh. 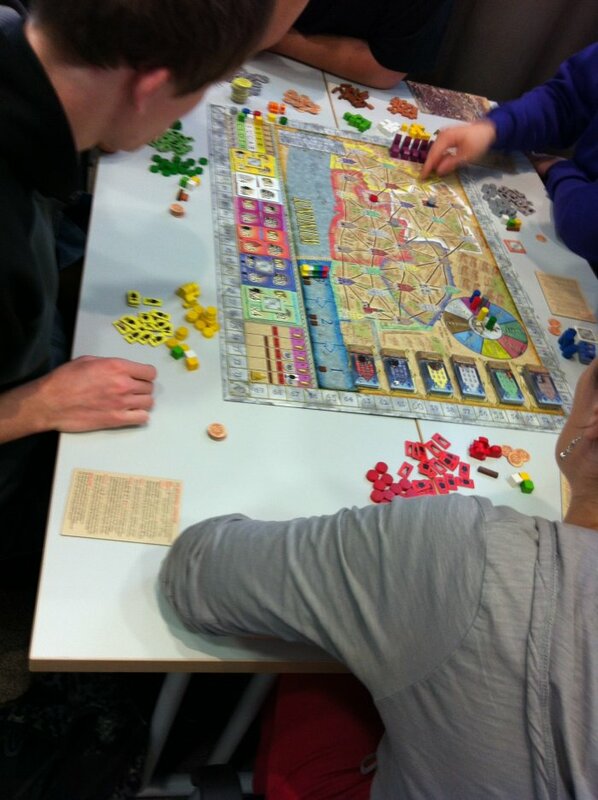 We bought Troyes, a new Belgian Eurogame, and played it in the evening, 4-player with Sebastian and Caroline. For the first try it took perhaps 2.5 hours – the rules look pretty comprehensive; no problems with them. It’s a medium to heavy game, and will probably take the 90-120 mins on the box. There’s a lot going on in the game. Worker placement gives access to mechanisms to convert resources to other types, and to generate VPs. However, the resources are primarily in the form of coloured dice – yellow for civil, white for religious, red for military. While high dice rolls help, they are not essential – in this game you can pay to use the other players dice, the price depending on the number of dice – from 1 to 3 – that you want to use for your action. Conversion of dice or adding to the dice total or other dice manipulation happens as part of your action, not as a separate one. Another great twist is that bonus VPs can be achieved through meeting the conditions set by your mentor (a character card randomly dealt at the start). But everyone can get the bonuses from all the characters, so there’s an element of bluff. Recommended.